Do you struggle with your confidence levels due to crooked teeth or gaps in your smile? Are you unhappy with your bite? Whether you’re dealing with speech problems, having trouble chewing, or simply want a straighter smile, orthodontic treatments can help. At Affinity Dental, we offer a range of orthodontic solutions that will help you regain your comfort and confidence, getting the bright smile you’re after. Orthodontics is an area of dentistry that’s focused on treating issues related to incorrect positioning of the teeth. If the teeth do not meet properly when the mouth is closed, you may suffer from an improper bite. This can impact your speech and chewing. In some cases, the misalignment of the teeth may increase your chances of suffering from damage or decay. Orthodontics is sometimes considered a cosmetic treatment, as it can be used to create a straighter, more attractive smile. There are many ways to approach orthodontics, and each treatment is highly individualized. Braces are one of the most common treatment methods. These use a series of metal wires and brackets to apply pressure to the teeth, which will gradually reposition them over time. Fixed-space maintainers can be used to keep a gap open rather than adjusting teeth for it to close. Removable appliances such as retainers, palatal expanders, and aligners are other tools that may assist with your orthodontic treatment. Orthodontics can help you address a broad range of problems. In general, any issues you experience with your tooth positioning or bite are treatable with some form of orthodontics. An improper bite, such as an overbite, underbite, or open bite. Misalignment of the tips of the teeth. If you’re dealing with these or similar issues, make an appointment to speak with one of our dentists today. No two smiles are exactly alike, and we can help you understand your needs better, so you have a clear idea of which path is best for you. The first step in any orthodontic treatment is a consultation. This may involve taking films of your teeth or getting a mold made. This can help your dentist or orthodontist better visualize the problem and plan for your long-term treatment. Orthodontics may take months or years to give you the desired results. After a thorough examination and consultation, you’ll have a step-by-step plan for getting the smile that you want. Our office is conveniently located in the mall and provides long hours, including both evenings and weekends. Completing an orthodontic treatment typically takes many visits, but we make it as easy as possible to get those scheduled around your other commitments. Our patients often find there are several paths that may ultimately get them to the smile they want. Metal braces are the most traditional route, but these are far from the only option. 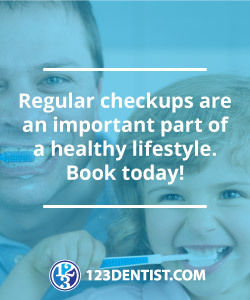 We also offer Invisalign, which is an option for most patients with crooked teeth, improper bites, or small gaps. With the Invisalign treatment method, you use a series of clear plastic aligner trays in place of metal wires and brackets. These trays fit over your teeth almost invisibly. You need to wear the aligner trays 20 to 22 hours a day, but you can take them out to eat and brush your teeth. You will change to a new tray every few weeks, but only need to come in for a visit every six to eight weeks. We supply you with several trays, so you can make the appropriate changes between visits. If you’re interested in orthodontics without the appearance of noticeable braces, make an appointment to talk to us about Invisalign. This may provide the ideal solution for your needs. What costs are associated with the treatment? What will my insurance cover in regards to orthodontics? How often will I need to schedule office visits? What will the progression of my teeth look like? Our friendly dentists can give you the answers to these and other questions, so you’ll know exactly what to expect from your orthodontic treatment. While we might adjust your plan as you progress, we strive to be as clear and direct as possible about the process ahead of you. If you’re interested in exploring orthodontic treatment options for your smile, contact Affinity Dental today. You can give us a call or request your appointment online. Our convenient mall location is open seven days a week to suit your scheduling needs.